You’re the expert on your product. 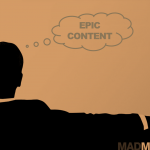 You’ve logged hundreds of hours collecting and analyzing marketing intelligence. Nobody walking the earth knows more about the features, advantages and benefits of your product than you. Then why is it so hard to turn all that knowledge into a compelling marketing message? You should be able to bang one out in all of 18 minutes, right? You can. You just need the right tool for the job. That is a quote from Stacy, a client I helped recently. She had spent months developing a complex new estate planning product that helps families plan for the care of disabled or dependent family members. In the process, she’d become expert in the laws and regulations governing family trusts and guardianship. That’s where she got stuck. All that expert knowledge became a stumbling block when trying to create her marketing message. 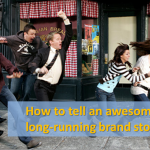 This is the story of how I helped Stacy nail her marketing message in 18 minutes, and how you can do it too. Back in my agency days we used a planning tool called a creative brief. Its purpose was to distill the key marketing information for a project into a one-page strategy document for developing creative messages for marketing communications. The document was a handy reference for keeping creative work on strategy. For the past two years Stacy has poured her heart and energy into creating a new type of trust for future guardians. She is passionate about this because it is personal. Her adult brother will always be dependent on a guardian. But her parents won’t always be able to care for him. Appointing a future guardian for him opens up a lot of legal uncertainties and entanglements. So she created the Future Guardian Trust™ to protect the rights of families to name a future guardian for their loved one. How do you explain the complexities of the system and the benefits of this new product in a compelling way that’s easy to understand? That was Stacy’s challenge. A Future Guardian Trust will give you the peace of mind and freedom of knowing your dependent family member will be cared for by the guardian you appoint, and they will have the financial resources to provide the individual care your family member needs. I just showed you how we drafted Stacy’s core message in 18 minutes (give or take 30 seconds! ), but let’s get real for a moment. There is still more work to do to flesh out the marketing message. 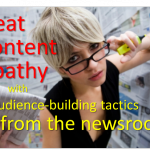 You still need to write content that will put meat on the bones and bring the message to life. Toward that end, I added two steps to this exercise: providing proof points to the “Big Promise” and a call-to-action. Proof/supporting facts: What specific facts or evidence prove the message is true? Regardless of your will, the court can tie up your assets indefinitely in probate, including the assets you set aside to care for your dependent child. A probate court can exercise authority over guardianship of your child regardless of your stated wishes in your will. A trust bypasses the probate court process. Call-to-action: What specific action should the target audience take and how will we lead them to take action? 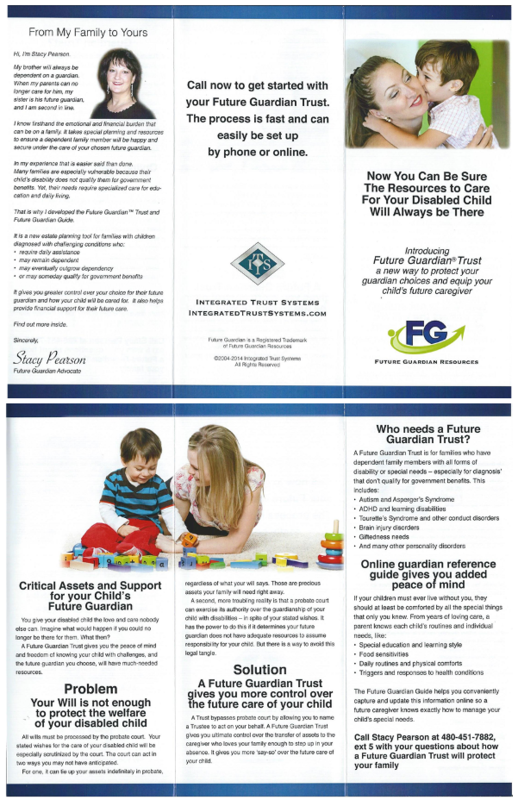 Call an agent today to learn how a Future Guardian Trust will preserve and protect the welfare of your dependent child. The process is fast and easy to set up by phone or online. Perfecting your message to resonate with your audience will take more than 18 minutes. 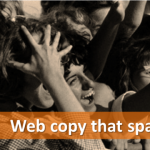 But this process dramatically cuts the time it takes to get to the core marketing message. It helps you center on the audience and enter into their situation. I have adapted this approach over the years to work for digital as well as print marketing. In fact, I don’t even call it a “creative brief” anymore. I call it my Marketing Message Planner. But the concept still works wonderfully to sort through all of the information in your head and pull out the pieces that are most relevant to your target audience. And it helps get you there fast. Would this help you? 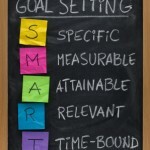 If so, you can download a Marketing Message Planner here. It’s free. 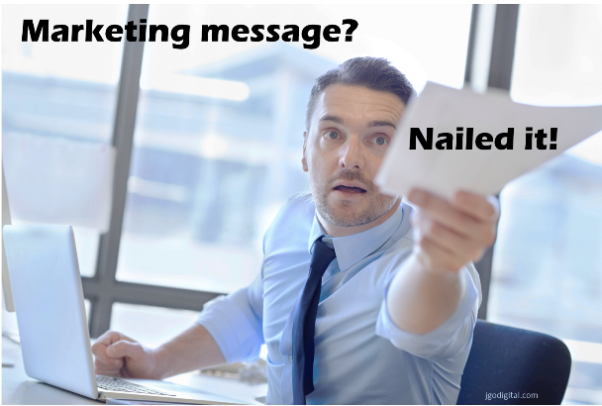 Need help creating relevant messages that engage and persuade your audience? I can help! Message me to set up a time to chat on the phone.